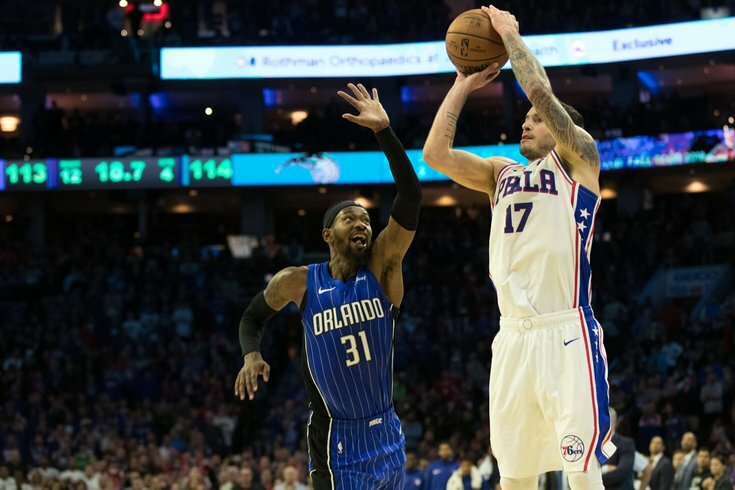 Philadelphia 76ers guard JJ Redick hits the game winning shot past Orlando Magic guard Terrence Ross during the fourth quarter at Wells Fargo Center. For all the talk about how Jimmy Butler created a "Big Three" in Philadelphia, there's a case to be made that JJ Redick is just as important in making this whole thing go. The Sixers' sharpshooter has a great two-man game with Joel Embiid, gives Ben Simmons the perimeter sniper he needs, and fits into basically any offensive setup the Sixers could possibly have. But the Sixers will be faced with tough decisions moving forward, and they need to decide who is worth spending their precious cap space on. That will put Redick in the crosshairs, as huge salaries for Embiid, Butler, and eventually Simmons clog up the cap sheet. For today's Sixers mailbag, this is where we'll start. Do you think Shamet has shown enough that the sixers don’t bring back JJ? Or that JJ would take a lesser role for less money for a few years and finish his career here. He seems to love the team and likes the role of mentor. I'm glad Douglas brought up the mentor/leadership part of this. Landry Shamet has been a revelation as a rookie, but Redick's value is not just in making shots. With years of experience and a sharp mind to match, Redick is as good as someone can possibly be at his role, and the wisdom he brings to the group is invaluable. So long as Butler is here, the Sixers are going to need to fill the roster with solid, positive clubhouse guys to make sure they keep a strong base in place. Redick is a respected voice in the locker room on a lot of fronts, both because he is good enough that his words carry weight and because his dedication/work ethic help set the tone for the team. If you ever get the chance, get down to a game early and look at how serious he takes warmups on game day. That's a reflection of who he is. I think the Sixers will be plenty interested in bringing Redick back, provided they can come to an agreement on a reasonable deal. The more interesting question to me is whether Redick decides he wants to be back. He'll have other offers, and no one can say for sure what Redick's priority will be. Will he chase the most money? Will he prioritize proximity to his Brooklyn-based family? Does he want to finish what they've started here, and hopefully chase a title? Both parties benefit from one another. Embiid loves working that two-man game with Redick, and Redick surely appreciates how much easier his life is playing off a dominant big man and a phenomenal passer in Simmons. Are those things enough to bridge a potential financial gap? The Pacers went after him this summer, and they will have a ton of cap flexibility this offseason to potentially change their rotation. A team like that might be more willing to come to Redick early in free agency, while Philadelphia pursues bigger fish. Shamet has been very good this year, but there's a difference between producing in a bench role with lower expectations than it is to be a shotmaker in crunch time on a routine basis. If the Sixers are smart, they'll try to have their cake and eat it too, bringing back Redick on a deal that ensures he's here to see things through while providing an opportunity for Shamet to take his role long term, should he prove capable. I think it makes a lot of sense on paper. But I think you're going to be hard-pressed to get Embiid to sit on this road trip. He told reporters on Wednesday evening that he looks forward to battling with Nikola Jokic, there is obvious incentive for him to take it to LeBron James' Lakers, and the Golden State Warriors now feature DeMarcus Cousins, one of the few big men Embiid has shown a lot of respect for since entering the league. It's hard to know what the right thing to do is with a back that seemingly flares up at random. Selfishly, I want to see him play against Jokic, but they have to do whatever is best for his long-term health. Should the Sixers trade their first round pick this year to help their bench? This is a cop-out answer, but the answer really depends on who they're getting in such a deal. If it's just one decent rotational player, I don't think that's worth it, since the Sixers are likely going to hunt for guys on expiring contracts. But if they can somehow get more than one rotation piece in the right age range, I would absolutely consider moving it. We discussed Mike Conley earlier this week, but the Grizzlies also have several role players who are probably obtainable if the Sixers are willing to pony up draft assets. Are guys like Garrett Temple, Justin Holiday, or JaMychal Green all that valuable on their own? Certainly not. But that group would add some steel and experience to Philadelphia's bench, and likely end up greater than the sum of their parts. Philadelphia's gameplan at this point doesn't necessarily have to be about improving their ceiling — that's pretty damn high — and instead can hone in on improving their floor. If the bench can simply not bleed points, the starting group is good enough to compete with anybody. I think with the Butler trade the Sixers basically decided they were going to compete now, and given recent results against some very good teams, I think they'll feel empowered to add another piece or two. Did the Sixers switch the direction they shoot in each half? I thought the “frosty” section was on the Sixers bench side of the court. I believe this is simply a matter of visitor's choice. Most teams tend to choose to warm up on the side of the floor near their bench, which has the side effect of placing their defense in front of the bench in the second half. It's strictly a personal preference thing, so the side that the Frosty Freeze Out ends up on is strictly based on that dynamic. We are in 100 percent agreement that Amir Johnson's present-day value as a player isn't there. I doubt that's going to change between now and the end of the year, and I think that makes him a logical cut candidate in this hypothetical. Do not discount how highly the team regards him as a clubhouse guy, though. He does an admirable job of keeping things light behind-the-scenes and does goofy things like asking for shout-outs during press conferences that endear him to his teammates. When Brett Brown acknowledged character first after they signed Brewer to his first 10-day contract, it was a subtle acknowledgment of the sort of person they feel they need in the room. So in the event this happens, I'd say Johnson is a likely-ish candidate, I just wouldn't call it a lock. What was Justin Patton's potential before he got hurt? I remember a couple mocks had him going late lottery so there must be some ability there. I like Bolden, just wondering if Patton has more upside as a potential backup center due to his size. I touched on this at length in my piece on Zhaire Smith and Patton yesterday, but a short version: lot of a potential as a rim runner/pick-and-roll partner, offers length and athleticism on defense, but he's still fairly raw and definitely needs to put on weight so he doesn't get bullied on the glass. If you want some more in-depth thoughts, here's where you can find them. I think Simmons has been pretty excellent on defense this year, and frankly that's the biggest reason why I continue to rate him highly in spite of the one glaring issue he has. I'm a sucker for two-way play, and Simmons' versatility is up there with basically any player in the league. It's also why I probably would have named him an All-Star starter over Kemba Walker — he drives winning with what he does on both sides of the ball, and I like to see players rewarded for efforts on both ends. He makes difficult tasks look really easy. The guy is 6-foot-10 and made Russell Westbrook's life miserable when he was matched up with him last weekend. Is there a legitimate argument for Landry Shamet to be top 3 in ROY voting? I think his solid 3 point stroke, improving defense and contribution to winning should put him in the conversation. Luka is leading a mediocre team in the west. And Ayton will win <20 games this year. Sure, I think there's an argument. I will say that I think we've collectively gone too far in dismissing guys who produce on volume to pump up efficiency at all costs. It is not easy to do what either of Luka Doncic and DeAndre Ayton is doing on offense, and while I think the latter has major red flags for long-term viability, that doesn't change the production, which is extremely good for a kid his age. Jaren Jackson Jr. is the guy I would have rounding out the top three (I might even place him above Ayton for defensive reasons), but if you're the sort of person who values production on a good team in this sort of exercise, I won't begrudge you for giving Shamet some love. It's Doncic's award to lose either way. What archetype should be prioritized first when #Sixers shop the impending buyout market? Anyone who can hit threes and play defense should be high atop the list. I'm still leery about trusting Jonah Bolden to be your backup center when push comes to shove, but I think Embiid is going to play so many minutes in the playoffs that prioritizing a rim protector would be a little silly. The Sixers need guys who can fill out their rotation and play in a variety of looks, and that will either be a three-and-D wing or a guard type in a similar mold. I would lean toward the former if they can find one, as I would continue to try to build a bigger, more athletic team to lean into the style Simmons allows you to play. This group should be striving to bully teams. does markelle fultz ever play in a game for the Sixers again? I am always hesitant to make predictions about this kid. Gun to my head, I say no. The fluid nature of his return timeline, the manner in which he left the team in late November, the agent's overwhelming influence on the situation, there are just too many signs pointing to this marriage being over. If you don't want to take my word for it, Zach Lowe briefly mentioned his name in a discussion with Jackie MacMullan this week, floating Fultz as someone Philly could offer in a potential Mike Conley trade. "It's over," Lowe said of Fultz's time in Philadelphia, "it's just a matter of when." Are we still hanging out later or nah? 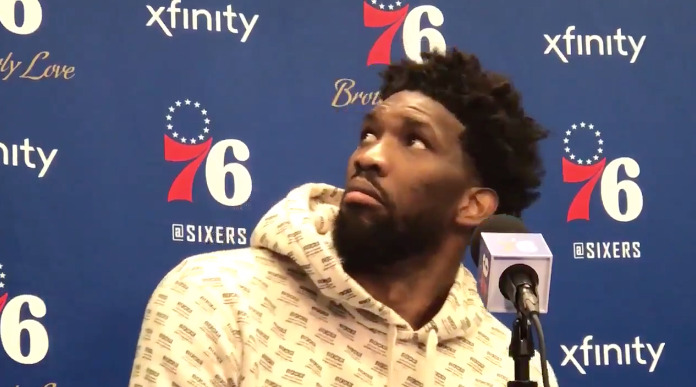 Joel Embiid hears a creature in the Wells Fargo Center ceiling. In other words, I really hope not.